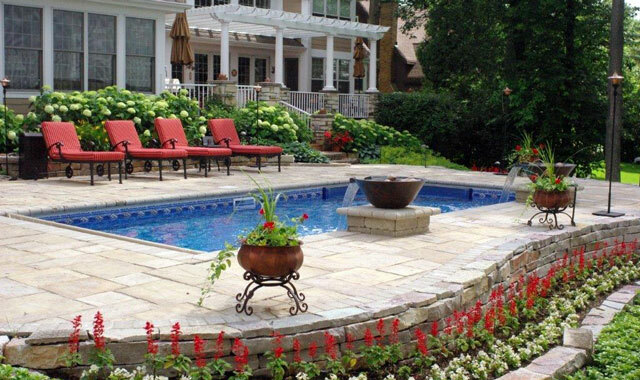 Homeowners in our region are maximizing their outdoor living spaces with new pools, patios, fireplaces and more, like this inviting space designed and installed by Crimson Valley Landscaping, in Rockford. The simple joys of life are often the best ones. For many of us, relaxing outdoors in the privacy of our own backyards ranks very high up on the satisfaction meter. For some folks, it’s all about having a serene refuge in which to start the day and sip coffee while listening to birdsong. For others, it’s all about inviting family and friends over for some lively conversation around an al fresco meal or the fire pit. Spring is an excellent time to shore up your home’s exterior and tackle projects both functional and aesthetic in nature. Here, local professionals offer some advice. As owner of Crimson Valley Landscaping, 1541 Westmoreland Ave., Rockford, Mike Sanders has witnessed an explosion of creative outdoor projects, both large and small. “In the past five years or so, I’ve noticed that people are really trying to maximize their living space outdoors,” he says. The homeowners in our region tend to be practical, he says. While they want an attractive outdoor space, they also think about things like energy conservation and easy upkeep. For this reason, high-maintenance ponds are out and pergolas are in. Pergolas can reduce the amount of sun, and thus the temperature, on a deck, Sanders adds. A south-facing pergola reduces the heat penetrating a home, too. The pergolas are built by Estate Deck & Fence, a construction company also owned by Sanders. It builds decks, porches, gazebos, fences, gates, arbors and trellises; it also installs outdoor lighting, which is another growing trend. “A good lighting plan extends the time you can be outside, makes the space safer and can also add beauty, when you use light to accentuate certain trees or other elements,” he says. Another concept that’s catching on is the meditation or healing garden, says Sanders. While the cost of hardscaping materials like stone and brick can be a shock, people are often surprised to learn how reasonable the cost of new plantings is, he says. Conversely, an outdated or overgrown landscape can make the entire house seem outdated. “Sometimes the best room in the house isn’t in the house,” says Kevin Obee, general manager of Benson Stone Company, 1100 11th St., Rockford. Obee is a close observer of the ways in which we live outdoors. • There are new composite decking materials that resemble wood planks but don’t require staining or painting. • There’s never been a wider variety of pavers on the market, offering the chance to customize the look of your project with all sorts of colors and patterns. • New rubber pavers are made from recycled tires; the material is dyed and made to look like brick. Installation doesn’t require tearing up an old patio. The interlocking parts can cover an existing deck or patio and are simple to install. • A new polymer sand is being used to fill the gaps between hard materials like concrete and natural stone pavers. It hardens to prevent weeds and anthills from taking over, yet is flexible enough to not crack. Tried and true traditional materials also remain essential. Nothing compares to the look of natural stone, whether this means a few carefully placed boulders, a meandering pathway, a limestone retaining wall or fire pit, or a sea of river rocks or pebbles filling garden beds. Benson Stone Co. has excelled at all things natural stone since its founding in 1930. Indiana limestone is the biggest seller, but Benson Stone also fabricates Kasota stone, Durango stone and more. It can make window sills, corbels, fireplace hearths, surrounds, mantels, wall or pillar caps, signs, steps, indoor and outdoor countertops, and much more. People want to choose materials that will coordinate with the look of their home, Obee says. If the home is contemporary, use a linear paver pattern for the patio. If the home is more rustic, go for the wood looks. “You want the patio to fit the look of the home and yet blend with the outdoors to give a unified feeling that flows into nature,” he says. One popular trend is to build a retaining wall around a patio; this adds privacy and beauty to a space, and also additional seating for guests. Screens, gates, brick walls, fireplace walls, plants, gazebo-style tents and awnings can contribute to a feeling of privacy and coziness. Obee also sees more clients requesting built-in grills to accompany their new outdoor kitchen and living space. There’s an important element of your home’s exterior that’s too easily overlooked: Your chimney. If it’s not properly cleaned and maintained, a host of problems may ensue indoors and out. If your chimney could use a good checkup and sweeping, Advanced Chimney Systems, 3486 Lonergan Dr., Rockford, is an EPA-certified company that can help. It specializes in all aspects of chimney care, from tuck-pointing, cap replacement and waterproofing to lining replacement, masonry and crown repair. Advanced Chimney can also help with another outdoor project: choosing and installing a long-lasting, high-quality cooking grill. A good grill may be the most-used item in your backyard, aside from that comfortable hammock or lounger. When it comes to a cooking grill, the options are numerous and can seem a little complicated. Grills can be oval, square, drum-shaped or something else, and are constructed with everything from cast aluminum and steel to ceramic. Among the many ways to fuel a grill, charcoal and pellets can impart various flavors as they cook the food. The Big Green Egg grill looks exactly like its name – a big, green egg. Built from high-quality Mexican ceramic, this cooker runs on natural charcoal and can serve as a grill, pizza oven, baking oven or smoker. “It’s an all-around grill,” says Heather Kraus, sales manager. “It uses one of the highest-quality ceramics, so it’s able to heat up quickly, holds consistent heat and cooks evenly. The Big Green Egg is the most popular ceramic grill on the market. It has a name people stand by.” The brand was founded in 1974. The charcoal used inside a Big Green Egg can be used over and over again, which means less stress and fewer trips to the store. The Traeger Texas Grill and Smoker wood pellet grill also is available at Advanced Chimney Systems. Unlike the Big Green Egg, pellet grills use an auger-driven system. More than 10 pellet flavors are available to contribute to food flavor, such as apple, cherry, hickory and mesquite. If you can’t decide between the ceramic or pellet grill, consider a gas Napoleon or Broilmaster gas grill. “We use, demo or own the grills we sell, therefore offering our customers firsthand experience and knowledge of the products we sell,” says Kraus. With such a wide selection of grills available, you can easily find the one that will best suit your cooking needs. Be sure to ask plenty of questions when you go shopping. Few exterior elements are as basic as attractive and efficient doors, windows and siding. And few things are more important than making sure your roof and gutter systems are doing their jobs. Lask Roofing & Siding, 1101 22nd St., Rockford, is a family-owned and -operated business that specializes in all of the above. For nearly 40 years, it has performed both large and small jobs for homeowners and businesses. Some products may require professional installation for a warranty to be honored. Homeowners should also be aware of potential legal hazards when it comes to do-it-yourself roofing or hiring roofers who lack a stellar reputation. Beware the would-be roofer who knocks on your door and offers a deal that sounds too good to be true. Professionally installed, high-quality roofing, siding, gutters, windows and doors can extend the life of your home and can save you money. Replacing drafty doors and windows limits excessive heating and cooling costs down the road. New vinyl windows are also lower maintenance than windows of yesteryear. They don’t peel, warp, crack or chip, and never require caulking or painting. Another service Lask Roofing & Siding provides is a specialty product called Gutter Helmet. Installed onto the home’s gutters, it helps to keep debris out and water flowing properly. It can protect the soffit and fascia, and greatly reduce overflow into gardens. The late Paul H. Lask founded the business in 1978. His father, Paul Sr., provided a pickup truck and a slogan the company still uses today: “Call Lask First.” Paul was joined by his brother, the late Tom Lask. Their sister, Lora Lask Matthews, now the company president, joined them in 1984. Tom’s sons, Toby and Adam, also took on leadership roles – Toby as executive vice president, Adam as vice president. Lora’s daughter, Chelsey, joined the company in 2012. Many employees have been with the company for two decades or more. Not a day passes when they don’t think about the legacy that’s been passed to them. Does your outdoor space cry out for a certain extra something? That “something” just might be a wrought iron gate, fence, stair railing, custom fire pit or other structure that combines elegance with durability and high functionality. The demand for iron has increased in recent years for both residential and commercial properties, says Rob Kapala, president of Rockford Ornamental Iron Inc., 1817 Michigan Ave., Rockford. His family-owned and -operated business specializes in custom wrought iron pieces for fences, driveway gates, railings, balconies and indoor/outdoor spiral staircases. Just as a good landscaping plan does, wrought iron embellishments help to make a property stand out as unique. Rockford Ornamental Iron Inc. only takes on projects that comply with safety regulations and are made to fit perfectly in the space. Every order starts with a free consultation and measurement of the property or installation space. Whether customers have a specific idea in mind or are exploring their options, the staff designers work with them one-on-one to create drafts of the possibilities. After the piece is fabricated at the Rockford facility, the staff installs it. The duration of the process varies greatly based upon the size and complexity of the project, and the time of the year. Kapala’s father, Fred, started the company in Loves Park, Ill., 65 years ago while he worked two other jobs. After earning a master’s in architecture from the University of Michigan, he returned home to partner with his father in 1985. Based on his concentration in structural design, he started to steer the company into expanding beyond just iron fixtures and railings and into structural beams and columns. The company adapted to changing demands and moved into a new Rockford facility in 1991. Improving your outdoor living situation may be as easy as planting some new bushes or as complex as re-roofing, installing a pool or building an outdoor kitchen. With better materials, endless possibilities and a solid array of professionals ready to help you, your backyard just may become your favorite “room” of the house. This entry was posted on Thursday, March 30th, 2017 at 11:59 am	and is filed under Annual Guide, Home & Garden. You can follow any responses to this entry through the RSS 2.0 feed. Both comments and pings are currently closed.